AEO is one of the latest buzzwords used by digital marketers focused on search engine rank. Answer Engine Optimization (AEO) brings SEO one step closer to usability and accessibility territories. I was invited to substitute for Marie Hayes, a long time friend in the SEO industry, for a series of webinars out of SEMRush, makers of SEO tools, training and well written educational blog. 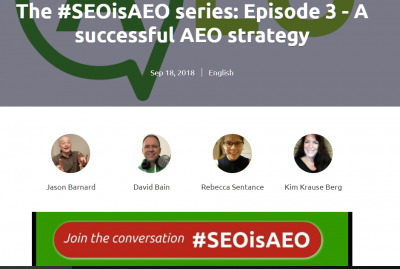 The topic is AEO for SEO, which would normally not be in my wheelhouse. However, the master mind of the website series, Jason Barnard, in his investigation into AEO, realized that optimization for answers is powerless without adding human elements to the search engine algorithms. In other words, this is a continuation, if not a robust re-boot, of what I’ve referred to since 2001; Holistic UX and SEO. Seventeen years after I began to practice the holistic approach to my work, plus teach and write about it, there is a renewed fascination for the user intent layer of digital marketing. Despite the simple logic of optimization for people instead of keywords, today’s computer technology and gadgets demand that we pay close attention to why we seek top rank spots and what we must do to not only get to the top of search results queries, but how to fend off the competition. What sets your brand apart may need to be more than having the answer or solution to a problem. The wins are in the details. 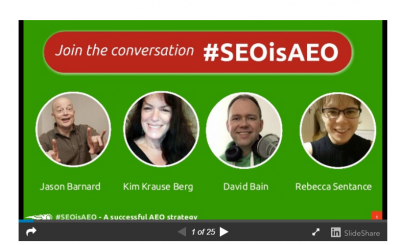 Check out the video presentation for AEO for SEO.